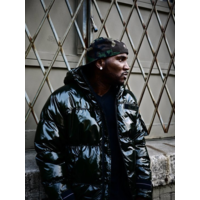 Jay Wayne Jenkins (born October 12, 1977), better known by his stage name Young Jeezy, is an American rapper and member of the hip hop group United Streets Dopeboyz of America (USDA) and a former member of BMF (Black Mafia Family). He began his career in 2001 under an independent label and joined Boyz N Da Hood in 2005, the same year his solo major label debut Let's Get It: Thug Motivation 101 was released. Its single "Soul Survivor", which featured Akon, became a top-ten hit in the U.S.